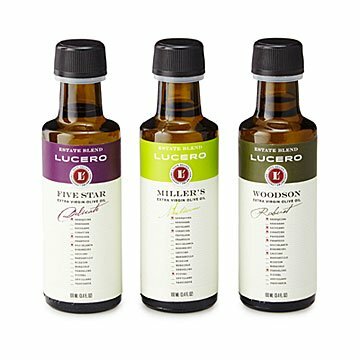 Ranging from delicate to robust, these three premium EVOOs are each made from a different olive blend. The third-generation, Northern California family behind this trio of handcrafted olive oils has won multiple domestic and international awards for their EVOO. Ranging from delicate to medium to robust, each of these three blends is made from a different mix of olives. They can be used for cooking, but their complex, delicious flavors are best highlighted when used as finishing oils, for dipping, or on salads. Five Star Estate Blend, made with Arbequina, Barnea, and Koroneiki olives, is a delicately flavored blend with green aromas and an herbaceous flavor with ripe tropical notes. Medium-bodied Miller's Estate Blend, made with Arbequina, Manzanillo, and Picual olives, has a leafy green aroma with a touch of bitterness and a slightly peppery finish. Woodson Estate Blend, made from Coratina, Frantoio, Leccino, Moraiolo, and Taggiasca olives is a classic, robust Tuscan style EVOO with a spicy green aroma and peppery finish. Grown, pressed, and bottled in California. Three 3.4 fl oz. bottles of olive oil.